Our children will be part of a generation where technological progress will change the world. Where all the generations up till Y were already amazed by the change from cd to Spotify, for generation ALPHA their world will change radically. The circular shift, fossil transition, a sharing economy, housing without carbon footprints and a plant-based diet as a base for nutrition. A large distance away from you, you think? WRONG. Just take your food as a focus point for example: Look at the strategic shifts big food companies make and think about the DNA of multiple successful start-ups. ‘Transition’ is the magic word here, and if we look into a company like the ‘Vegetarische Slager’ (The Veggie Butcher; check that sausage roll!! ), our only conclusion can be that the standard is shifting. Framing vegetarian food as a niche is long way gone and the moment it really hits the mass consumer market is close. Companies like Unilever and New York Pizza are already embracing it, because big profits are luring in the deep and are up for grab. The good thing in this transition is; the market and consumer behavior reacts the same as it would do in the ‘normal’ market. The new kid on the block gets the same criticism when success is starting to pop-up and with big sales, big questions arise. Questions about nutritional values, technical product declaration, use of sugar and salt and the why and how of soya or palm oil usage. This causes a remedial effect, empowering the sustainable agenda. So: Adapt, Adop and improve! A perfect example is the term ‘Flexitarian’ or flexible vegetarian. Wow, this person had a witch hunt going on until just now. But do we really have to make a decision here? 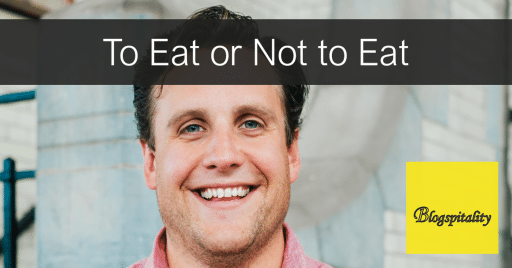 Is it really: to eat or not to eat? We live in a free world where there is something beautiful called ‘the middle road’. A mild solution like this will only help the discussion and even work as a catalyst! When we approach the consumer with more tact, options and compassion, he or she will move forward and try something new. It is just a no-go area to mark the meat-eater as a barbarian. These full-blown food ethic fanatics and good-food crusaders have made their point and really proven their worth. Now, with the issue prominent on the agenda we need a new chapter and a shift to a concept solution for the broad consumer of everyday life. Look at what is happening in the world; we are on the right track! Our daily routine at We Design Food shows everything mentioned above already. I am not joking. We do not care if our clients come from a niche, high -end market of is part of the big food giants. The number of vegan dishes on the menu exploded, an active shift to no waste is happening, trash is better processed, BBQ fanatics integrate veggie food in their company DNA, usage of salt and sugar in ready to go food is dropping like mad, the share of vegetables in an average meal is increasing, plant based alternatives for meat as a resource for consumers to use in their kitchens are already on the market and last but not least: the quality of meat and fish is improving significantly. Of course, we are not there yet, but I am here to celebrate every success and every step forward is worth a hashtag! #Goodfood! So, just to be clear; at We Design Food we are no do-gooders. We are not positioning ourselves as the ‘sustainable party in your project’ (blegh). The only thing we want is more quality in resource, food prep & process and off course: more flavor. Every piece of the puzzle here is important and small steps are good enough to move forward. What we develop and create for our clients is a genuine, workable and sustainable product; ready for the current market and compatible with future generations. For us that is a sustainable transition. So we are not talking about animal cruelty, but we address margins, portion sizes, menu-mix and a target group. We point out the positive financial consequences for sustainable options and so the Organic or Vegan option ‘in the mix’ on the menu becomes a no brainer! It is simple; it saves money and brings new costumers. On our website you find more examples of what we do, described in different cases in multiple professions. Our professional ‘Alliance’ is very important in serving our clients with quality solutions. We just think working together is better than doing everything alone and working is a team existing out of autonomic professionals is really inspiring and it keeps you sharp and relevant. Sustainability in a project is that corner stone being a vision in our workflow and products. It is essential that our clients realize that solutions and concepts also need to work on the long term. What we ask of them, is a long breath and an eye for the bigger picture. This being the essence of our company, it also brings an immediate selection in clients; more in the restaurant sector then retail or the hotel chains. It is so good to see that from a social-economic trend and a new demographic dynamic the work field changes and quality wins. It is extremely exiting to think about what will happen in five or ten years. We are closely monitoring for sure! Want to check some of We Design Food’s work? Go to Cafe Comodo in Amsterdam and have a taste of all the beautiful food they serve. We developed the food concept including the integration of a digital kitchen management system.